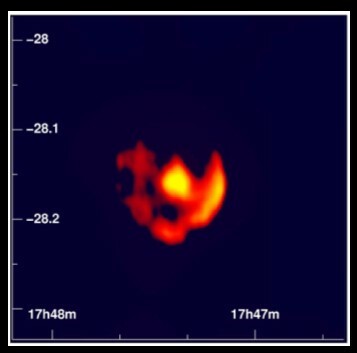 Radio map of the supernova remnant G0.9+0.1, showing a bright core region and a partial shell (Helfand and Becker). Radio images of the Galactic Center region (see Dec. 04) include a number of shell-type supernova remnants. G0.9+0.1 is a composite remnant, showing a partial shell - about 8' in diameter - surrounding a bright core (see image above). Assuming that the object is located at a similar distance as the Galactic Center, one can deduce an age of several 1000 years. The radio emission from the shell is presumably caused by electrons accelerated in the supernova shock wave. The bright core - which is also resolved as an extended structure in X-ray observations with Chandra and XMM - is identified as a pulsar wind nebula, akin to the Crab Nebula (Oct. 2004). A highly relativistic flow of electrons and positrons accelerated by the fields of the pulsar provides the energy source feeding a termination shock, where particles are accelerated to even higher energies in turbulent magnetic fields. A pulsar candidate (CXOU J174722.8-280915) is seen in Chandra images as a point source near the center of the nebula, however no pulsed emission has been detected. 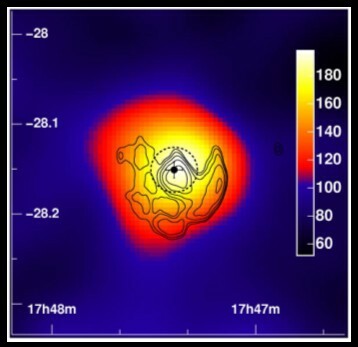 Already the first observations of the Galactic Center region with two H.E.S.S. telescopes in 2003 showed a faint signal at the location of G0.9+0.1. In 60 h of follow-up observations between March and September 2004 - now with all four H.E.S.S. telescopes - a highly significant signal is detected (13 sigma), consistent with the position of the core of the supernova remnant (Fig. 1). Within the angular resolution of H.E.S.S., the source is point-like, with an emission region smaller than 1.3' (rms). The location of the source and the size limit strongly suggest the pulsar wind nebula as the source of the VHE gamma-ray signal, rather than the supernova shock wave. 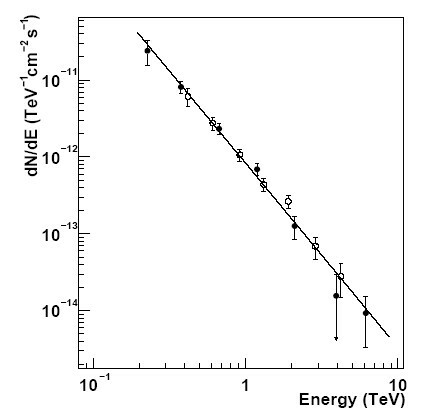 Over more than a decade in energy - between 200 GeV and 6 TeV - the energy spectrum of gamma rays follows a power law with a spectral index of 2.4 (Fig. 2). At a flux corresponding to 2% of the flux from the Crab Nebula and assuming a distance of 8.5 kpc, the total power radiated in VHE gamma rays is 2x1034 ergs/s, roughly half of the power output of the Crab Nebula, the only other established VHE source of this type. 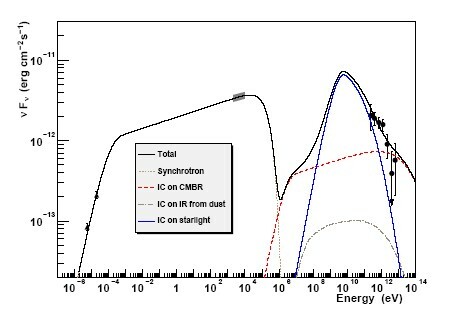 Indeed, the wide-band energy spectra (Fig. 3) are well modeled assuming a primary population of electrons, which emits synchrotron radiation in the radio- and X-ray bands, and which creates the VHE gamma-rays by scattering ambient low-energy photons to high energies. Close to the Galactic Center, starlight photons represent to dominant source of target photons. At higher gamma-ray energies, the Klein-Nishina effect starts to suppress interactions with the (eV) starlight, and the photons of the cosmic microwave background take over, effectively adding up to a smooth power low spectrum in the H.E.S.S. energy range. Fig. 1: Smoothed map of the VHE gamma-ray counts detected by H.E.S.S. (Color scale), with radio contours superimposed. The cross indicates the best estimate for the location of the TeV source, the dashed circle the limit on the (rms) source size (assuming a Gaussian source distribution). Fig. 2: Energy spectra of VHE gamma rays detected with H.E.S.S., using the regular cuts to select gamma rays (closed symbols) and special cuts to improve the signal-to-noise at high energies (open symbols). Fig. 3: Wide-band spectral energy distribution of G0.9+0.1, interpreted as synchrotron radiation at lower energies and as Inverse Compton upscattering of starlight, dust and microwave background photons at higher energies.